One sure sign that the drive coupler is bad is if the washer will fill with water and pump out ok, but it just won’t agitate or spin. Replacing the motor coupler is the most common repair task on this washer and is a pretty easy job, even for appliance repair virgins. How easy? About two mugs on the SUDS-0-meter. 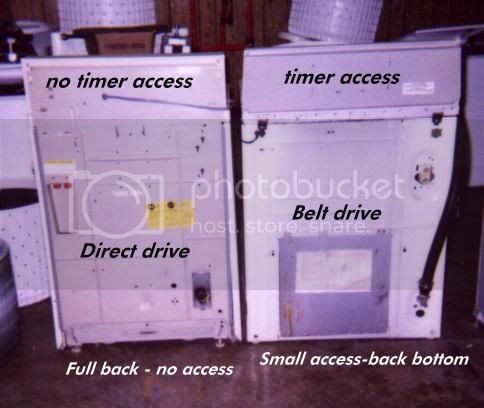 How can you tell if your washer is the direct-drive or belt-drive model? Like this. Finished already? See, you’re a whiz at this! Ok, so with the machine stripped naked like a fatted calf in a butcher shop, we focus our keen Vulcan squinties on the pump, down in front, and remove the two clips holding it on to the motor. 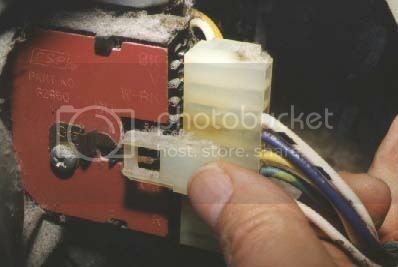 Then pull off the pump, unclip the wiring harness from the motor and the two wires from the capacitor (if present). Then remove the two motor clips (top and bottom) to remove the motor. Wallah! The motor, by the way, is double-shafted (for those of you in Palm Beach, “double-shafted” means it has two shafts). 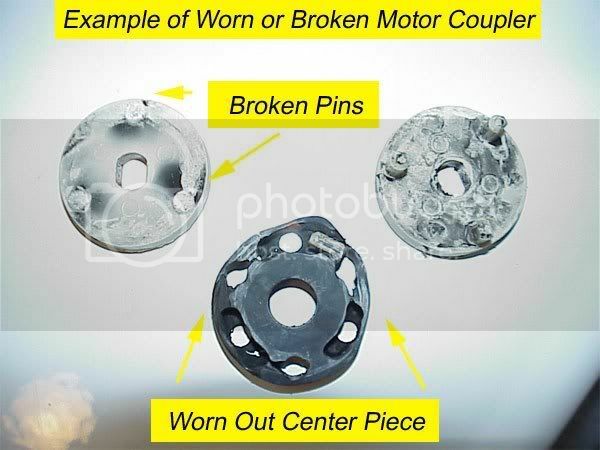 The coupler is the three-part piece you see between the motor and the transmission (the other side of the motor). Your old coupler probably looks something like this, or even worse. Here’s what a new coupler looks like. Incidentally, for an excellent and detailed interactive diagram of the guts of this washer, see this page. You’ll be glad you did. When you’re all done and you have the guts all tucked back in place, replacing the cabinet is just as easy…if you know the trick. And remember to reconnect the lid switch harness or you’ll be scratching your head wondering why the washer won’t spin. Ok, that’s about all the rocket science involved with this little gig. All that’s left for you to do is order the coupler, maybe even a genuine repair manual for more adventurous repairs in the future. And, of course, your love offerings to the United Samurai Beer Fund would be received most joyously. 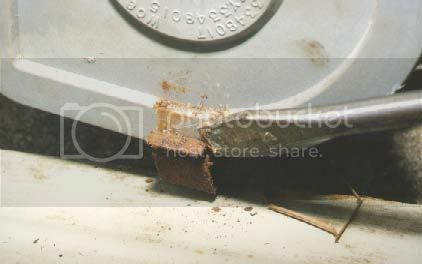 This entry was posted in Washer Repair on May 30, 2004 by Samurai Appliance Repair Man. Ok, I replaced the coupler on my Kenmore. When I started the machine back up, it agitated for a few seconds, then the gears locked up, and it broke my coupler again. What do I do now? That’s a bad transmission. Get a new washer… assumming, of course, that you installed the coupler correctly. I started to replace the coupler and when I put on the third piece (the last plastic piece)on the bolt, it broke. I got another part and yet again, that piece cracked. I can still use the washer with it cracked, but I don’t understand why it seems the bolt that the coupler is supposed to fit onto is a bit too big for the holes in the coupler. It’s a Kenmore washer and I got the part from Sears…so I’m not really understanding the problem. Do you? This site has been very useful. What’s missing though is getting the darn coupler in place and the motor back on. It’s not quite “Assemly is the reverse order of removal” The coupler pieces have to be hammered onto the shafts. Getting the motor with coupler attached into the holes of the rubber is very tricky because of its weight, aligning the coupler holes and motor mount “bushings?” and there is an annoying piece of cardboard in the way. After all the black rubber motor mount bushings fell off I had no way to know which way they went on. They fit both ways and don’t stay in place on their own. More tips on getting this thing back together would be useful. I couldn’t find them elsewhere in the site. Alex was doing in his replacement of the drive coupler but mine went very smooth. I had the washer filling with water for a test run 5 minutes after I walked in the door with the part. The replacement was the exact opposite of the removal. What a great site for the do it yourselfer. Thanks!! OK, replaced my coupler, let the washing machine run for a couple months and then started getting that burning smell that accompanied the failure of the first bushing. What is the primary cause of bushing failure? The problem I am having with my washer is that it is making a loud banging noise while trying to spin on the spin cycle. The agitator starts to spin then stops after the loud noise, this process repeats through the cycle. I removed the coupler to find it is in good condition. I then tried to spin the agitator by turning the part the three pronged part the coupler was once connected to. The agitator turned fine when I did this. Do you have any idea what the proplem could be? Some detailed discussion of noise problems in this washer and their cures in this thread from the Samurai School of Appliantology. I have an idea that if you require more information about what’s wrong in the forum, you awwta post it in the Laundry Room, not here.